Since I’ve been doing my low-carb, high fat diet for a while now, I don’t really miss much about the refined carbohydrate foods I used to eat. But I do miss the convenience of bread. There are some foods that seem too intense to appreciate without the mellowing influence of putting them into a sandwich, there are burgers and sausages that just cry out for something more convenient than a salad as a base, and there are sauces and juices that always seem to seep out of delicious stewed and roasted meat dishes that I just want to sop up with something convenient. I’m not big into replacing the foods I don’t eat anymore with artificial substitutes. The concept of eating real food just seems to fly in the face of making fake versions of familiar items. I imagine diabetics and vegetarians often have the same issues when faced with burger-shaped vegetable patties, artificially sweetened candy substitutes, and processed vegetarian sandwich slices. None of that stuff is as appetizing as the real thing. However, I have seen so many people refer to recipes such as the Atkins Revolution Rolls or the similar Oopsie Rolls that I decided I had to give it a try. After all, how bad could it be? Besides, the night I started researching recipes my hubbie caught sight of the pictures and promised me he’d make a special trip to buy me a package of the almond flour I’ve been wanting to experiment with the next day if I made some of these for him that night. He even offered to separate the eggs for me. How could I refuse? I used to bake a lot. I was good at it, too. I enjoyed the exact measuring, the careful tending to doughs and batters, and the enthusiastic responses my creations received from friends and family. It’s something I really miss, even though the foods I used to make when I was baking don’t tempt me anymore. But as a result, I have some pretty strong opinions about how baked goods should be constructed. 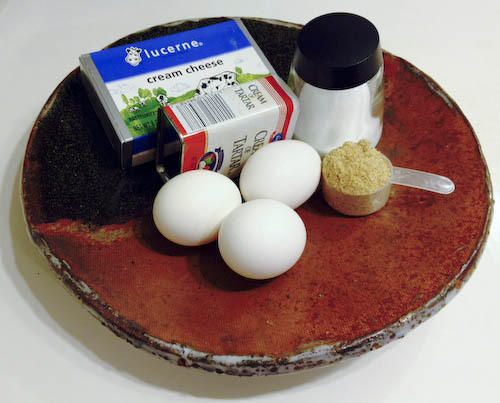 There are a lot of very similar recipes available for these egg-based rolls, with a few minor variations in terms of fat sources, fiber, and flavorings. 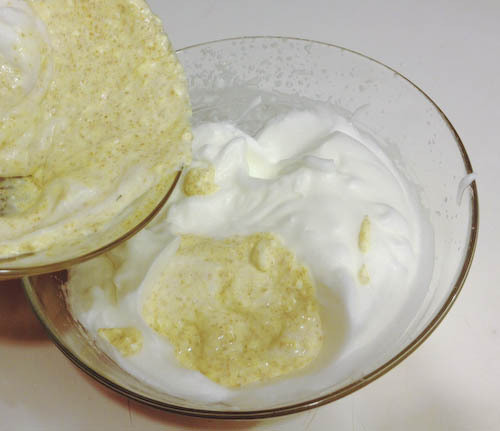 Knowing that I wanted something versatile that could be either savory or sweet, I decided to take a basic recipe using cream cheese as a foundation, and augment it with a heaping tablespoon of ground flaxseed for body, and a dash of stevia powder and salt. 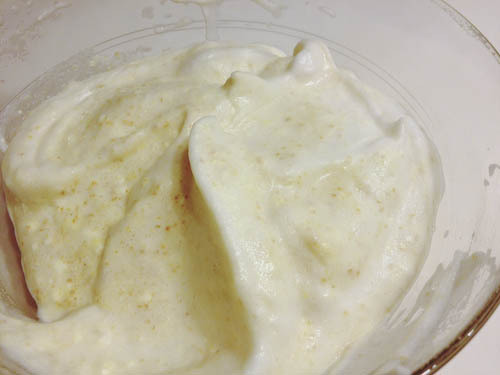 The recipe may sound a little daunting if you’re not familiar with the concept of whipping egg whites and then folding in a thicker batter base without deflating them. But if you’re anything like me, it’s probably something you’ve seen many times on cooking shows, and it’s not as difficult as it sounds. 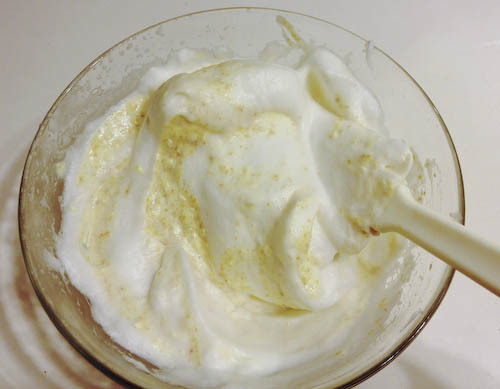 There are only a few simple ingredients, and nothing that would trigger any carbohydrate issues. First you need to separate the whites and the yolks completely. (No yolk in your whites, or they won’t whip up right.) 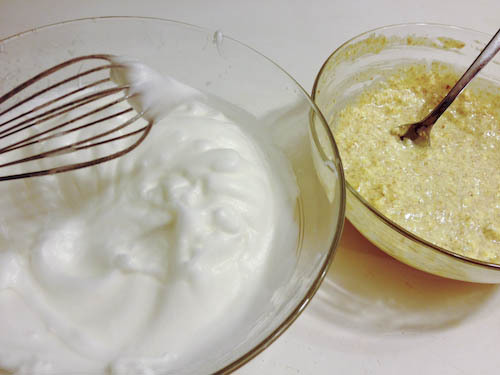 It’s best to mix together the heavier ingredients in one bowl first, and then put them aside and whip the egg whites in a separate, clean bowl. 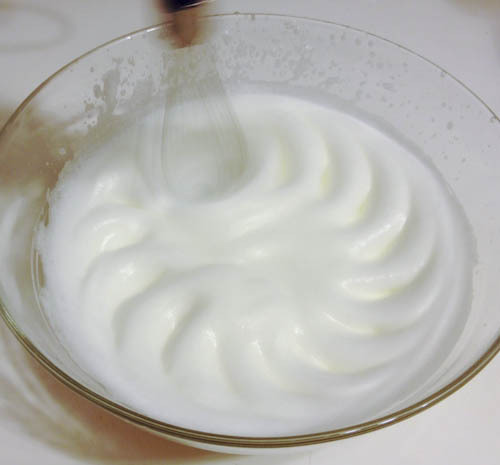 I’ve made meringues, and I have a very reliable hand mixer and some cream of tartar on hand to help make them hold their shape, so getting egg whites stiff isn’t a problem. and then gently fold the slightly lighter base into the remainder of the whites just until they are integrated. 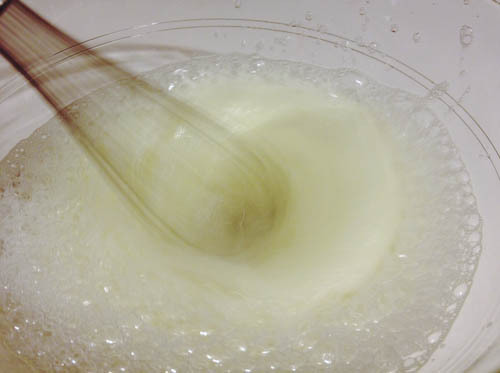 Use a slicing motion to cut the mixture in half, and then fold the bottom over the top slowly, without stirring. Leaving a few streaks of white is not a problem. 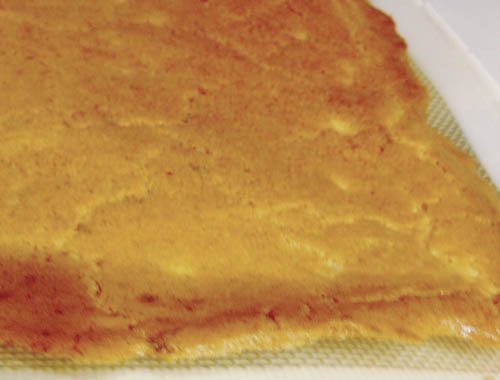 When baked, this recipe will stick aggressively, so a non-stick baking surface is essential. 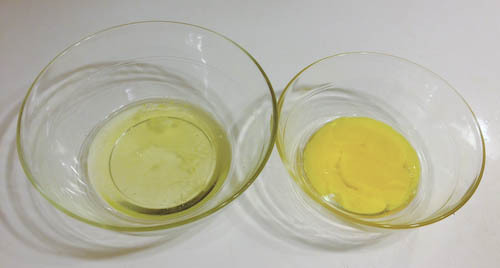 I prefer to spray olive oil on my liner to enhance the fat content. The bread-like quality I want to achieve relies on a good crust. I used to bake a lot, so I still have a silicone tray liner which I’ve cut in half for toaster over convenience. Parchment paper is also a good choice. 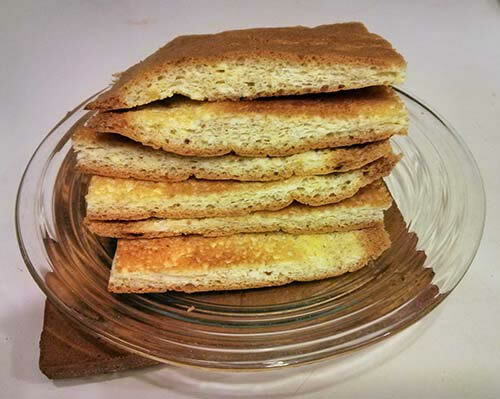 Just spread the batter gently into a single layer about the size of six slices of white bread, or dollop out six rolls in the shape and height you desire. 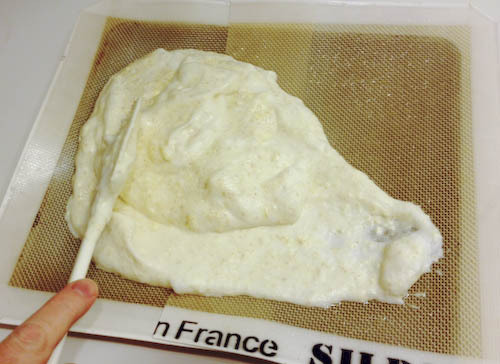 Try not to bang or otherwise disturb the batter, to avoid deflating the egg whites. 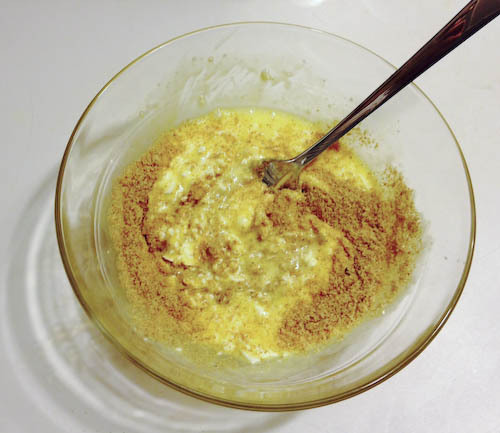 At this point you may want to sprinkle on coarse sea salt, sesame seeds, or some other low-carb bread topping. Bake this slowly in a 300 degree oven for at least 35 minutes for a single layer, or up to an hour for thicker roll shapes. Let the bread sit briefly on the liner until fully set before inverting it on a rack to cool. Then store them in a loose paper bag. The bread will be crunchy on the outside and very moist on the inside initially. 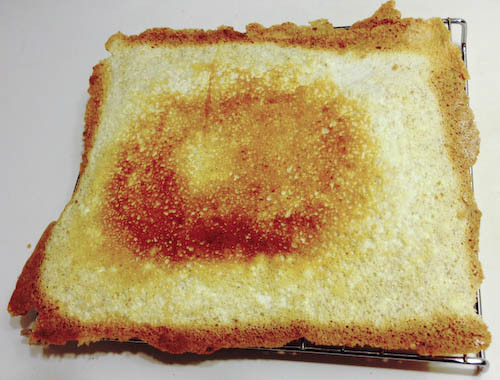 After a day or two, it will take on a more familiar white bread texture. The final product can be sliced or paired to make a sandwich, chopped and toasted to toss into a salad, or served alongside saucy meat and vegetable dishes. Or be creative. I’m sure I don’t have to tell you all the ways bread can enhance a meal! Preheat your oven to 300 degrees Fahrenheit, and prepare a baking tray with an ungreased silicon liner or parchment paper. 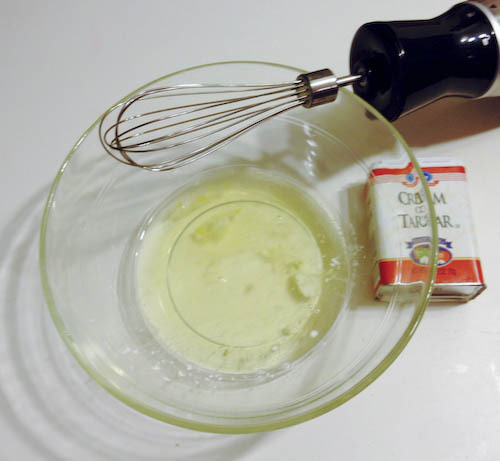 Separate the eggs and whip together the egg whites and the cream of tartar until stiff peaks form. 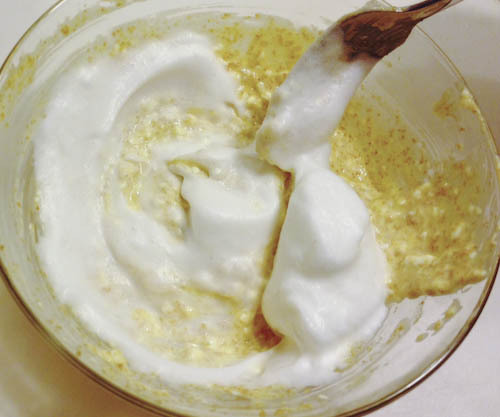 Put the egg whites aside and whip together the remaining ingredients until smooth. 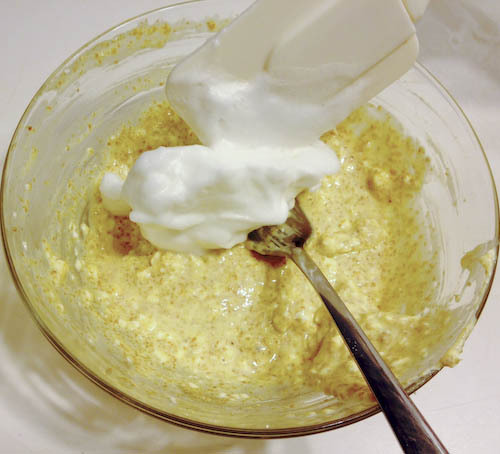 Mix a few tablespoons of the whipped egg whites into the egg yolk mixture to lighten it up a bit. 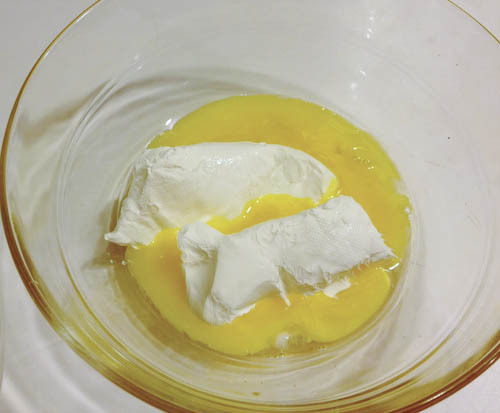 Fold the egg yolk mixture into the egg whites gently, trying not to deflate the whites too much. The final mixture may be streaky, and that’s just fine. 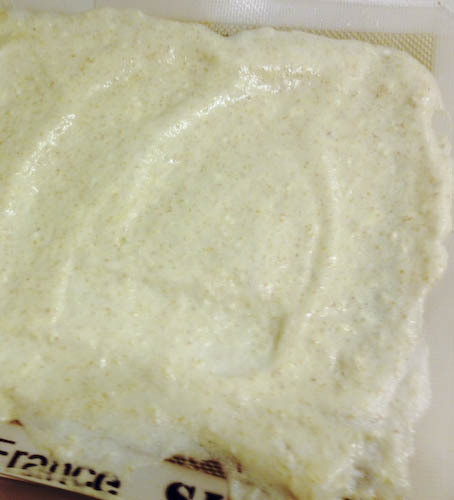 Spread the batter evenly in a single layer, about 1/4 inch thick, or dollop it into six even mounds. Bake a thin layer for about 35 minutes, or a tray of thicker rolls for up to an hour. Be sure to let the bread sit on the tray for several minutes after cooking before moving it to a rack to cool. Once it’s cool, the bread can be cut into slices. Store the slices or rolls in a loose paper bag for a day or two.